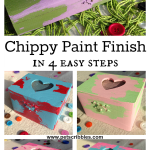 Today I’m sharing how to make a colorful chippy paint look you’ll love. This is a two-page post, so get ready to dig in! First, we will find inspiration in your own closets, and then on the second page we’ll take a look at 10 color combinations to get your own ideas flowing! 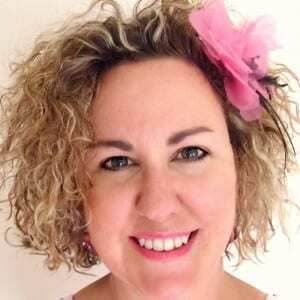 This post was originally intended to be a fun look back at my very first tutorial that I shared here on Pet Scribbles. 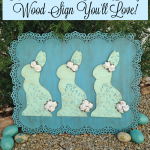 But as I reflected on the post, I realized I ended up using this same paint technique for additional crafts and DIY projects over the years, with results that never looked the same. I also have developed a love of playing with different color combinations. 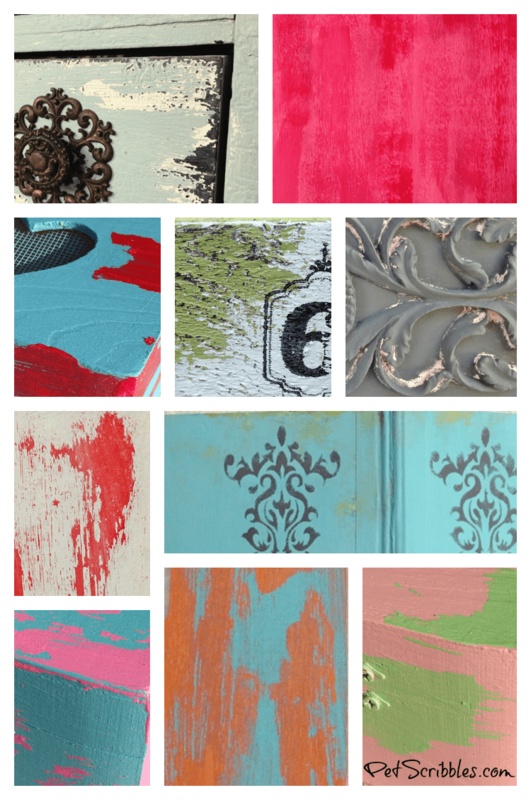 I’ve always chosen fun colorful shades of paint to demonstrate chippy paint finishes, so it’s easy to see the finished effect in the pictures. If I only used subtle colors, it might not show up as well on your computer monitors or mobile screens. But then as my own style developed, so did my love of color! Where do I find my inspiration and ideas? That doesn’t quite help when you’re reading this in your bathrobe with a cup of tea after a very long day. (I’m laughing as I type this, because I’ve been in that exact situation. It’s a nice thought but doesn’t always work.) Sometimes you’ve got to go looking for inspiration. We all have lots of clothes. 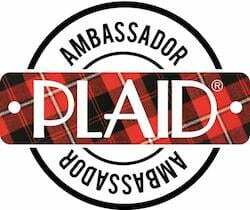 Our closets and dressers are filled with suits, dresses, comfy t-shirts, leggings, tops, scarves, sweaters and socks. 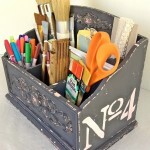 Each of the items I listed above will help you find some color inspiration. Hopefully, you purchased the items hanging in your closet — or folded in your dresser — because you liked them. The cut of the garment, how it fits, the color or colors. And every detail put together is what makes you feel either really good, or not so hot. Admit it: we all have clothing that makes us feel fat, or uncomfortable. And those clothes rarely get worn, am I right? Your favorite t-shirt: what are the colors in it? Your go-to scarf? Your favorite dress? Your sweater that gets worn the most? Look through your closet and start pulling items that you’re drawn to the most. You will begin to learn what colors you are drawn to. 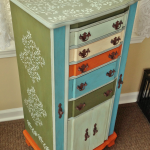 You will find some really fun color combinations already put together that you love. 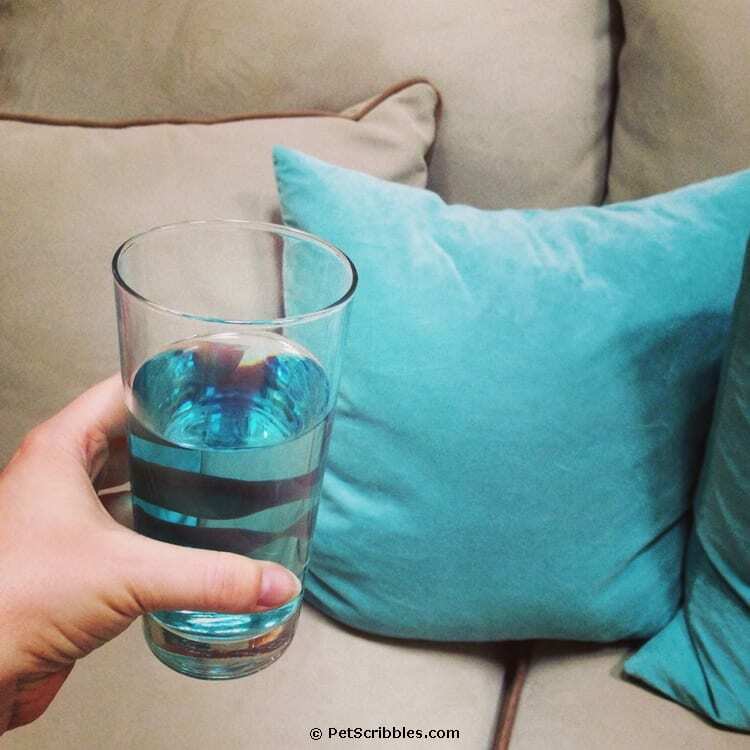 I shared this picture on Instagram a couple of years ago, because it was too funny that my new flavor enhancer for my water — which was a blueberry flavor — perfectly matched the accent pillows in our living room. But I share it as an example of what I’m drawn to. I’m definitely drawn to certain colors, like blues and teals and grays. In each example above, you might just say that I like “light blue” as a color, especially if you were just looking at each image individually and not lined up in a row. But when you see all of the items together in this collage, it’s obvious that I’m drawn to many different shades of blue. This is what you’ll begin to notice as you focus in on what colors you’re drawn to. The floral pattern on the left is a piece of decorative paper I was using in an art project. 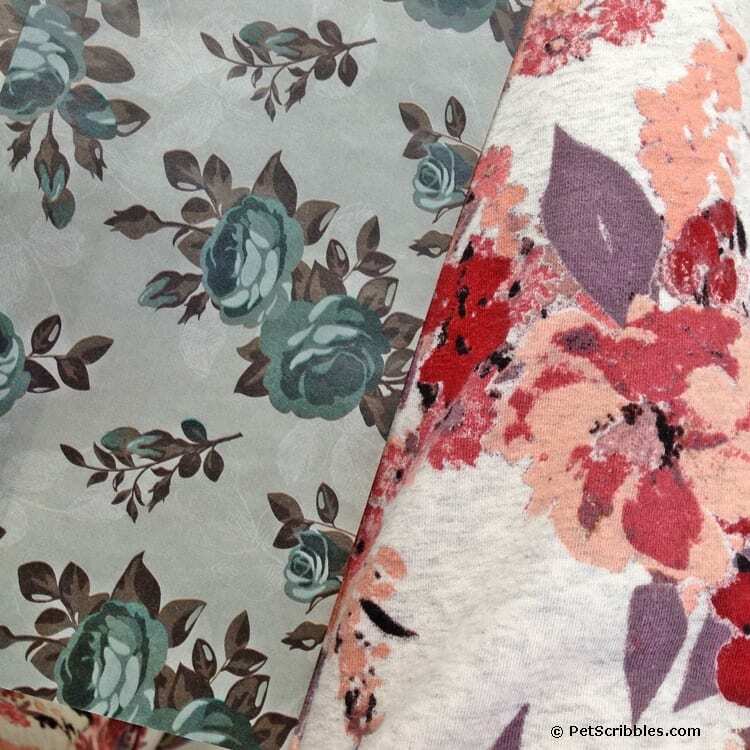 The floral pattern on the right is from the pants I was wearing that same day. So now you see two examples of florals that I love, but in two completely different color combinations. And the floral pants — which I practically live in, because they are so comfy — are in a color scheme that I wouldn’t normally be drawn to. 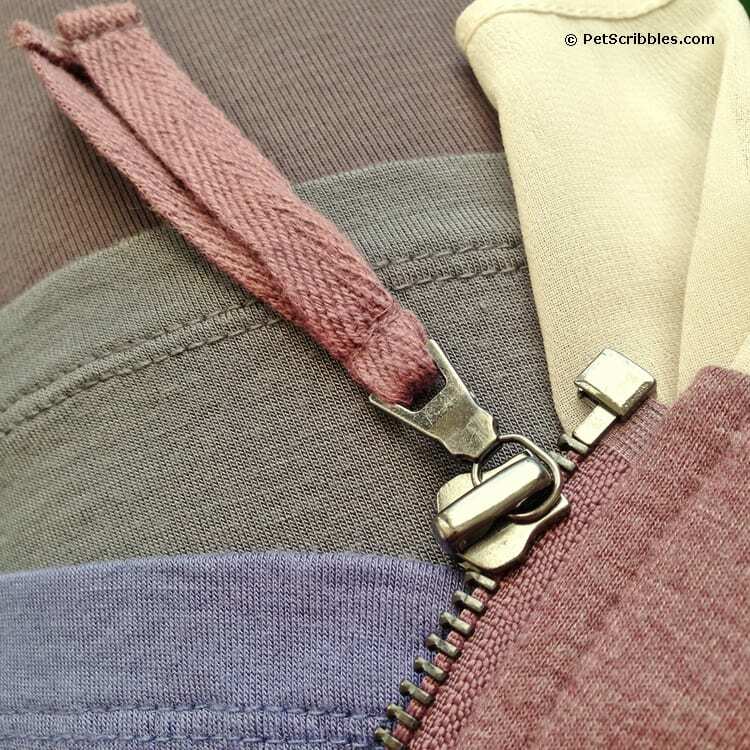 The top dusty plum color are the leggings I had on; the gray color is a long tank top; the periwinkle color is a t-shirt I had on over the tank, and the zippered sweatshirt was my jacket, which happens to have ivory lace trim on it. How in the world did I end up in these colors? Well, after I purchased the floral pants I mentioned above, I needed tops to go with it, and thus began my foray into a different color scheme. It also opened my eyes a bit more to playing with color not only in my painting projects but also in what I wear. And how does this all translate to colorful chippy paint looks you’ll love? 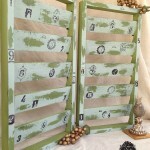 Here’s an example of inspiration translated into painting . 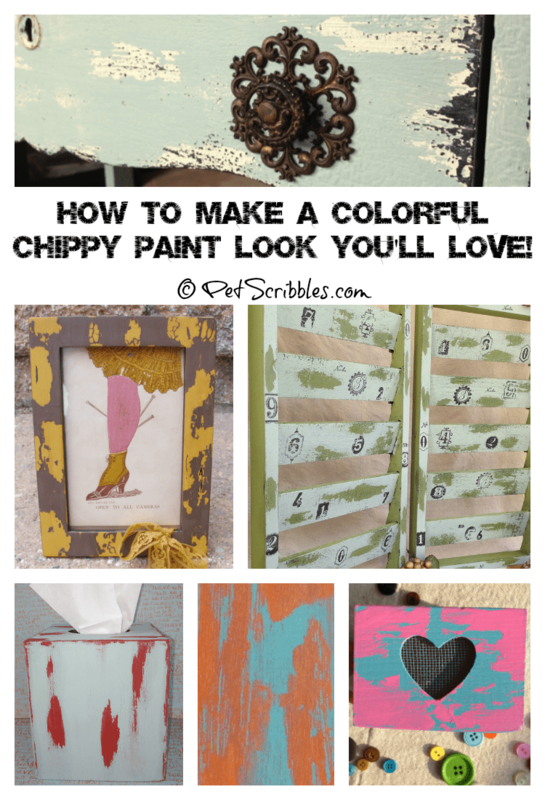 . .
As you scroll through the following colorful chippy paint look examples, remember to keep one main thing foremost in your mind . . . 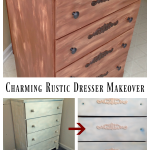 Remember: You can always do this same faux paint technique in the paint color choices you love best. Use bold colors together for a vibrant impact, or choose two similar shades of paint for a more subtle result. I’m not here to have you copy me, but rather to show you techniques you can try yourself, in your own style with your own colors. That’s what I want most for you!